The Riders were busy over the past week, with groups of athletes competing in four meets in four different locations and two states. A strong contingent of “JV” athletes headed west to Larimore for a meet against Class B varsity competition last week. In a field of 17 teams, the boys placed second with 98 points. George Nyanforh (11.25 pts) and Bryce Enerson (7.5 pts) were the top point scorers, as Nyanforh placed first in the long jump (20’4.75) and teamed with Grant Lelm, Jeff Corcoran, and Angel De La Cruz in the 4x800m Relay to place 4th. Enerson placed first in the 4×100 and 4×200 relays, as well as third in the 4×400 and eighth in the long jump. 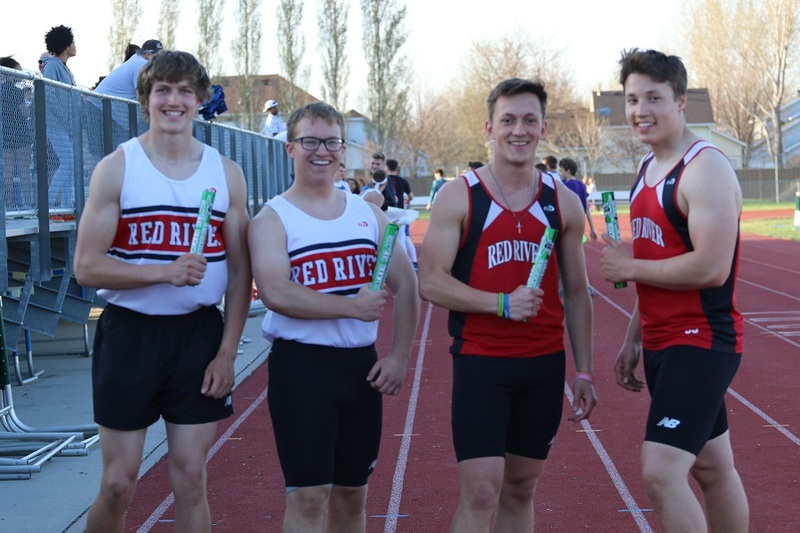 The all-sophomore 4×100 relay team’s time of 46.06 is believed to be one of the fastest times in school history for a team consisting of solely underclassmen. The other big point haul came in the 3200m Run, which saw 5 of 6 athletes set new PR’s and four place (3rd-Matt Rongitsch-11:07.23/4th-Broden Diederich-11:08.00/7th-Jeff Corcoran-11:12.04/8th-Ryan Prusak-11:12.04). On a hot and windy day in West Fargo, Tyler Burian put on another sprint clinic, with victories in both the 100 (11.29) and 200 (22.65). The 100 time was a personal best by .03 seconds. The team’s other event victory came from Bryce Enerson in the 110 hurdles (15.92). Strong performances were turned in by senior Pierson Painter (11.5 pts) in the 300 hurdles (4th-43.62) and 110 hurdles (4th-16.51), as well as Cole Ogren (2nd-152’8) and Cade Johnson (3rd-151’6) in the javelin. However, the biggest thrill of the meet was the final event on the track. Excitement had been building all day for the 4×100 Weightman’s Relay. As defending champions, RRHS had a target on their backs. Despite immense pressure on their shoulders, the quartet of Ryan Ostermeier, Austin Oehlke, Garrett Kovar, and Cade Johnson obliterated the competition in impressive fashion. Could a thrower’s relay dynasty be in the making? Wait one year to find out. The prestigious Howard Wood Dakota Relays annually attracts the most competitive athletes in the Upper Midwest. A small group of Rider distance runners and javelin throwers gathered in Sioux Falls in search of state qualifying times and big throws. In near perfect conditions and under the lights Friday night, junior Jake Arason delivered with the state qualifying 3200m time he so desperately was seeking. Results were unclear immediately following the race, which only added to the suspense. When final results were released, it was discovered that Jake was only .06 seconds under the qualifying standard. On Saturday, Tim Dunham raced in the 1600m and managed a big season best (4:39.79). The worst luck of the weekend belonged to the javelin throwers. Originally set to throw Friday night, their event was moved to the end of the meet Saturday due to a loss of daylight and no lights in the throwing area. Around 3:00 PM Saturday afternoon, the entire remainder of the meet was canceled due to an incoming thunderstorm. Although the javelin hopes were dashed, Liam Ogren did set a new school record in Kettle Corn Consumption. On another hot and windy day, Tyler Burian stole the show with a 100m victory and new personal best of 11.08 seconds. With that result and his 200m (22.54) at Shanley, Tyler now sits #7 in the 100 and #6 in the 200 All-Time for RRHS. He also placed second in the 200 (22.74) and lead off the second place 4×200 (1:32.90) relay team. The 4×200 team of Burian, Stoker Short, Painter, and Nyanforh currently ranks #6 in the state. Other highlights came in the 300 hurdles, where Painter placed second in a new personal best and state qualifying time of 41.36. Enerson also raced well, placing fifth in a big PR of 42.72. In the 110 hurdles, Enerson made a big jump forward, racing to second place in a PR time of 15.48 seconds. He finished the meet with 17 points, trailing only Burian’s 20.25 points. Nyanforh (15.25 pts) won the triple jump (43’6.5), as well placed sixth in the 200 (23.48). The other big point scorer was senior Seth Hanson (15 pts), who won the javelin for the third meet in a row (173’2) and placed 4th in the discus with a PR toss of 135’6. Tandeski’s deep javelin army was again impressive, scoring 31 points and placing five (2nd-Brett Klefstad-158’3/3rd-Sam Schumacher-155’7/4th-Liam Ogren-154’0/7th-Cade Johnson-146’0). Coming up this Friday is the Radke/Orvik Classic, held this year in Minot. The meet features select boys teams and and utilizes true team scoring, with only three athletes per event. On Saturday, the Riders host the EDC JV Outdoor meet at Cushman Field. Events get started at 11:00 AM. The Bob Zimney Last Chance Meet will be the final home meet of the season, set for Monday, May 14th. Senior athletes and parents will be honored at 2:45 PM prior to the meet.